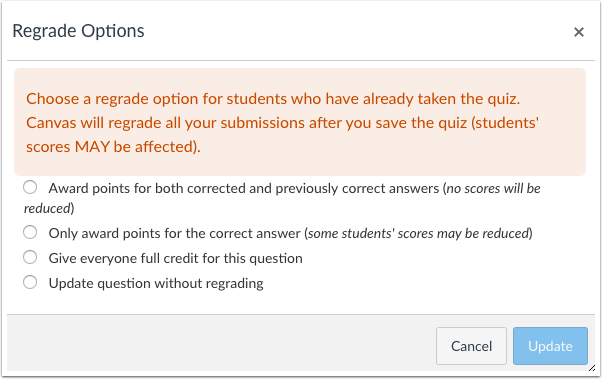 If you accidentally published a quiz that needs to be corrected, you can use quiz regrade to edit existing quiz questions and tell Canvas to recalculate student grades. Quiz regrade only works with specific quiz question types and only applies to students who have already taken the quiz. Adding or removing a question does not trigger the quiz regrade feature. Additionally, changing the point value for a quiz question also does not trigger a quiz regrade; the student's submitted quiz will show the updated point value, but the current grade won't change in the Gradebook. 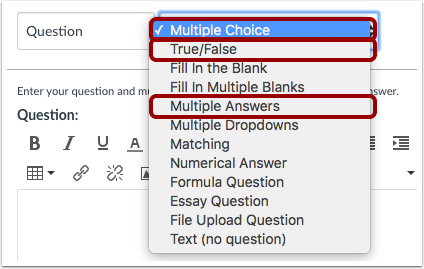 If you have edited your quiz in one of these three ways, you should moderate the quiz and let the student retake the quiz. This feature only applies for students who have already taken the quiz and only the existing quiz questions have been changed. Currently, quiz regrade is available Multiple Choice, True/False, and Multiple Answers question types. Quiz regrade does not apply to questions linked to a question bank since questions may be used in more than one quiz. Additionally, adding or deleting answers from a question with submissions disables the option to regrade that question. When you change the correct answer in a quiz question, Canvas presents up to four quiz regrade options, depending on the question type. Using quiz analytics or student feedback, you may find that students found a question too confusing, or you realized that the question could have been listed with multiple answers when only one was selected. In cases like these, you can select the Award points for both corrected and previously correct answers option to avoid penalizing your students. Note: This option is not available for Multiple Answer questions. Occasionally an incorrect answer may get marked as the correct answer for a quiz. The Only award points for the corrected answer option allows you to correct the answer and give credit to those who selected the answer that should have been correct. In some cases it might be appropriate to simply give everyone full credit for a question. Select the Give everyone full credit for this question option. If you need to improve your question or answers for a future quiz, you can select the Update question without regrading option to update a question without regrading the students who have already taken the quiz. Previous Topic:How do I view a quiz log for a student? Next Topic:How do I regrade a Multiple Choice quiz question? Table of Contents > Quizzes > What options can I use to regrade a quiz in a course?